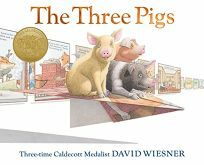 As readers have come to expect from the inventive works of Wiesner, nothing is ever quite as it seems in his picture books. This version of the pigs' tale starts off traditionally enough—warm, inviting watercolor panels show in succession the tiny houses, their owner-builders and their toothy visitor. But when the wolf begins to huff and puff, he blows the pigs right out of the illustrations. Though Wiesner briefly touched on this theme in his Free Fall (fans may note a strong resemblance between the dragon in that volume and the one featured in these pages), he takes the idea of 3-D characters operating independently of their storybooks to a new level here. The three pigs land in the margins, which open out onto a postmodern landscape hung with reams of pages made for climbing on, crawling under and folding up for paper airplane travel. Together the pigs visit a book of nursery rhymes and save the aforementioned dragon from death at the hands of a knight. When they get the dragon home, he returns their kindness by scaring the wolf off permanently.